Dan and I are in Turangi, New Zealand this morning and we're headed to Wellington today. It's been raining for two days and we haven't had luck doing much outdoors. We did see the Wai-O-Tapu thermal area yesterday, though, and it was beautiful. It's cloudy this morning, but at least it's not raining. Hopefully we'll be able to take a tour of the Tongariro National Park and see the mountain that was Mt. Doom in the Lord of the Rings movies. If not, we'll make our way to Wellington a bit early. We have tons of photos so I'll try to post some later tonight. The taxi should be here in about 30 minutes to take us to the airport. Dan is on the way home from USC where he was taking the final exam for his summer math class. Our suitcases are sitting by the door and we're ready to go on our honeymoon! We'll be back on July 11th so I'll post more about the wedding then. See you in about two weeks! Just call me Mrs. Feller! Dan and I are leaving on our honeymoon tonight so I don't have time to write much about the wedding, but I do want to say that it was the most wonderful day of my life. Everything was perfect and we want to thank everyone who made it that way. We are very blessed to have each other and all of the people we love. So now that that we're married, Dan and I are off to New Zealand and Australia on our honeymoon. We'll see you when we get back! 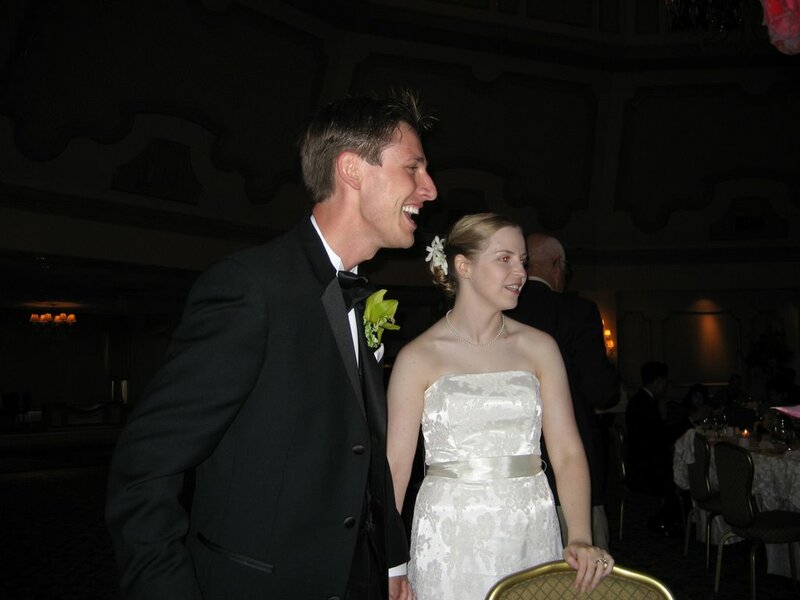 I haven't had a chance to keep up with my webpage posts over the past week, but today is my wedding day and I wanted to write something to mark the occasion. In about an hour I'll be in the prearation room taking the first steps in getting ready to walk down the aisle. I can't believe we've made it to this day. Six years ago Dan and I went on our first date and today we are getting married. We've had a wonderful time so far and I look forward to sharing every day with him for the rest of my life. I love you, Dan, and I can't wait to be your wife! While making cookies tonight I'm watching the MST 3K episode "Quest of the Delta Knights" on You Tube. All of my recipes are on the internet so I have my laptop hooked up in the kitchen. Watching movies online while baking is just another way technology has made our lives more interesting. I'm at work again today, but I thought I'd share a couple of pictures from our brief trip to Las Vegas. 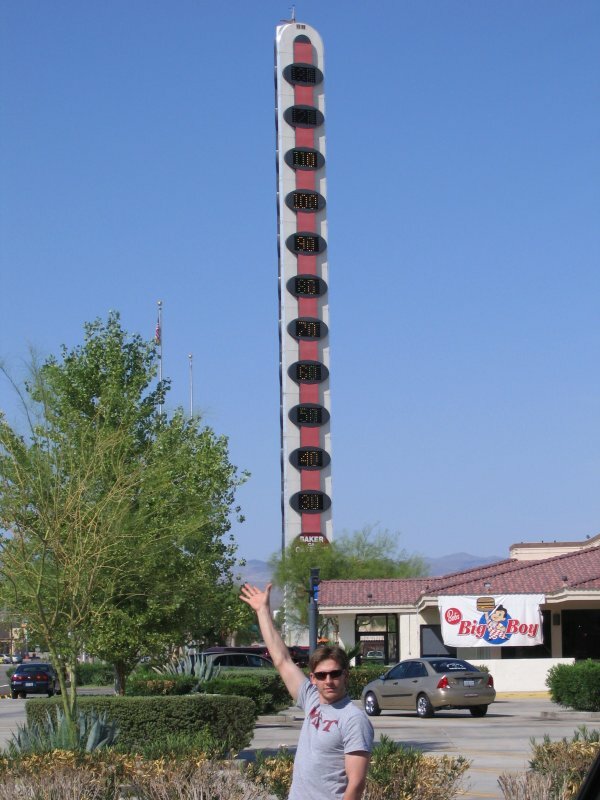 The first one was taken in Baker, CA, which is the home of the world's tallest thermometer. Unfortunately for us it read 110 degrees when we got there! The heat in the desert is oppressive, especially after leaving Los Angeles a few hours earlier where it was about 75 degrees. One good thing about Baker, though, is the Mad Greek restaurant (right across the street from the thermometer) which has delicious gyros. 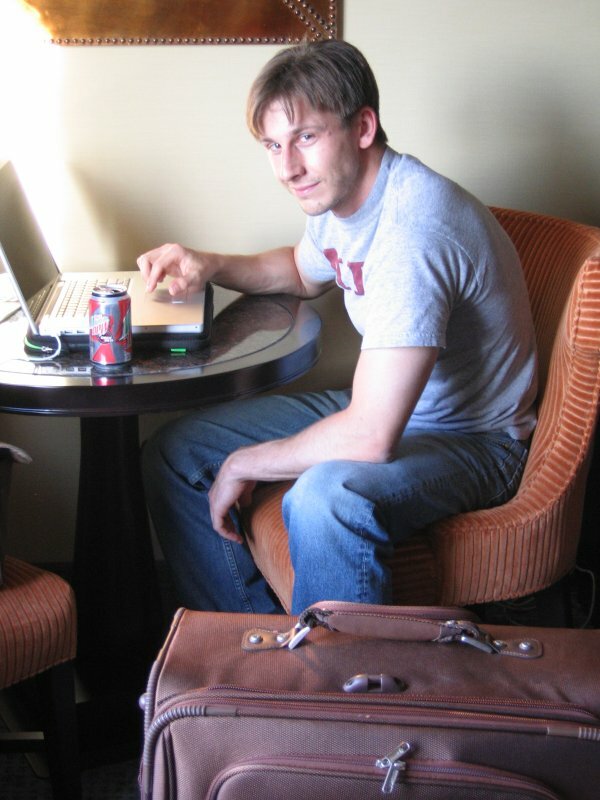 The second picture was taken after we arrived in Las Vegas in our room at Excalibur. I wanted to take a photo of Dan with his new suitcase that he got for our honeymoon. At least the wheels on this one work (unlike his old suitcase)! I've got my first batch of wedding favor (lemon sugar cookies) in the oven now so I have a little time to compose an update. One of the reasons I went to work today is that I wasn't there yesterday - I was on the way to Las Vegas with Dan to go to The Police concert instead! We were only in Vegas for about 14 hours, but we accomplish our main goal, which was to see the concert. It was a bit strange being there with most of the audience at least 15 years older than we are, but I guess that's because The Police were at their peak more than 20 years ago. Watching the other ticketholders awkward dancing was at least as entertaining as the concert itself! But as Dan pointed out, the coolest part was seeing Feyd-Rautha (aka Sting, for the non-geeks) in person! Now we're back home in LA (where it's somewhat cooler than 110 degrees, as it was in Baker, CA yesterday when we stopped for dinner) and in the wedding home strech. There is so much to do before we leave for San Diego on Thursday. So now I'll go back to making cookies and getting that out of the way. I'm just about to leave work and go to the gym. It's one week until the wedding and of course I'm completely swamped. When I sit down with my laptop tonight I'll write a more extensive update. I don't know exactly when that will be, but I have so much work to do on my computer tonight that I'll fit it in somewhere. I hope I can fit some sleep in somewhere too! There are some days that you have the energy you need to go to aerobics. And there are other days that you have the socks you need to go to aerobics. Today was neither of those days. There wasn't much I could do about my lack of energy, but fortunately I was able to borrow a pair of socks from someone. I felt pretty stupid for forgetting to put socks in my gym bag this morning. At least it all worked out all right. I hate to miss aerobics. As the wedding draws closer our weekends have seemed to disappear. Since I'll be missing more days than I can cover with my vacation allocation, I had to work yesterday to begin making up the leftover hours. And since I was already at work it was the perfect opportunity for me to go to the gym. So by the time I got home there wasn't time to do anything, but prepare for the next day. I had a little more free time today, but it was mostly spent on domestic activities. I did go to the gym this morning, though, to make up for one of the workouts I missed last week. After that I did laundry, made dinner, washed dishes, and went to the grocery store. At least our household is ready for the upcoming week. And if I get enough sleep tonight I just might be ready for it too. It's Friday night and I have a million things to do, but I'm sitting here watching Robin Hood instead. At least I put some clothes in the washer first so that might be considered multi-tasking. What I really need to do is send some more emails to our wedding vendors, but since I have to go to work tomorrow I'll put that off until then. Tonight I think I'll read a book and go to bed early. That sounds wonderful. I just bought tickets for Käthe and me to go to Disneyland a few days before the wedding. Talk about your crazy bachelorette party! The wedding rings are now in my possession and they look great! That's one more item to check off our list of things to do. There have been some new developments due to our trip to San Diego on Tuesday that have made that list much longer. 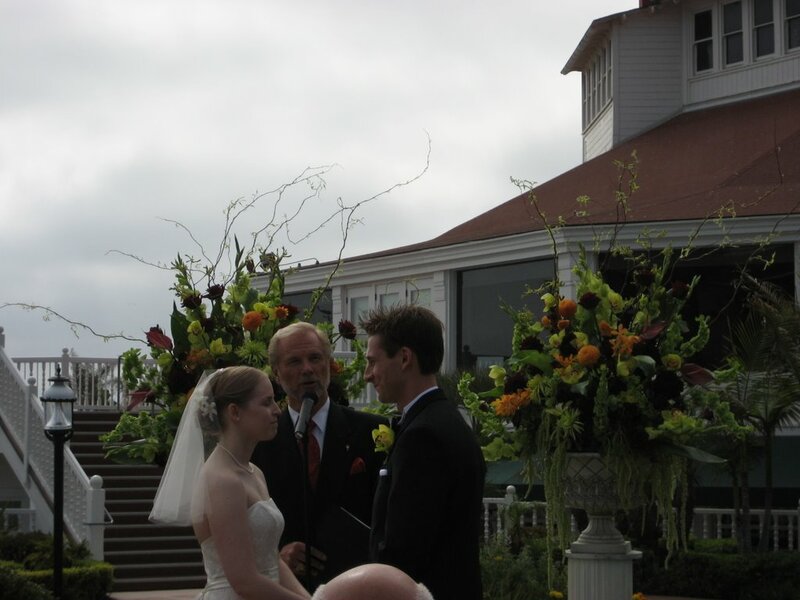 The biggest change is moving our reception into the beautiful Hotel del Coronado Ballroom that overlooks the beach! We originally booked a smaller room that we were happy with, but because of other events scheduled at the hotel that night there wasn't any viable place available for our cocktail hour. And since no one reserved the huge, gorgeous ballroom for the night of June 23rd, the catering manager offered it to us for our reception! It not only solves the problem of a cocktail hour location, but it also gives us space for a larger dance floor and lets the reception last past 10 PM. It's going to be great. Now that we're just over two weeks from the wedding I've been writing emails to all of our vendors to get the details ironed out. It's a lot of work, but visiting the hotel on Tuesday made me really excited about the wedding again. It's almost here! I'm picking up our wedding rings today! More details later. 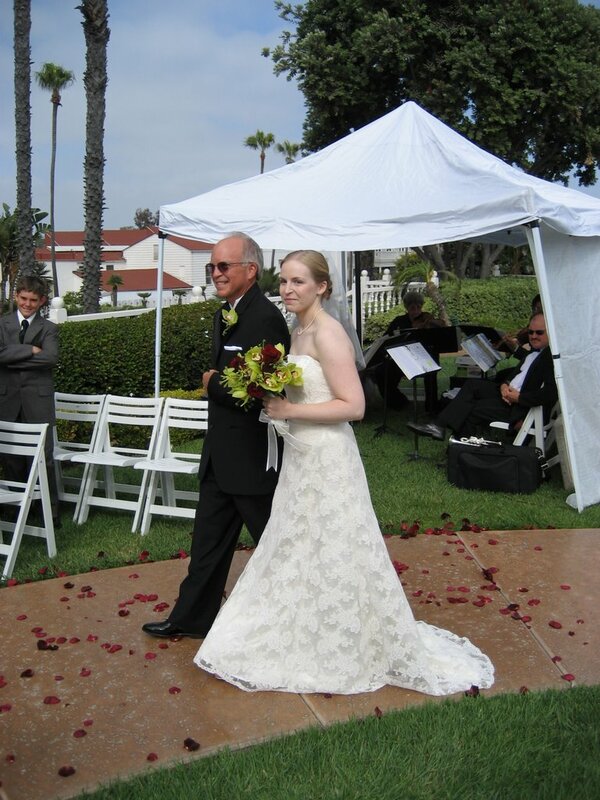 Dan and I are driving down to San Diego tomorrow to take care of some wedding-related business. Now that we're less than three weeks from the wedding there are lots of little details that need our attention (i.e., the items at the bottom of our wedding to do list). We're meeting with our florist in the morning, the catering manager at the Hotel del Coronado in the afternoon, and our photographer in the evening. We're even having some engagement photos taken! It'll be a busy day, but hopefully we can relieve some of the wedding planning stress. That will certainly be worth the trip. I know I've said it before, but I love cooking when I'm not in a rush. Currently I'm making dinner (tomato soup with ravioli) and baking cookies (pumpkin chocolate chip) at the same time. I've found three recipes that I will definitely be making for wedding favors, but I need at least two more. The favor boxes I ordered should hold about five cookies, so five recipes would be ideal. I just realized that I left the vanilla extract out of the pumpkin cookies, though, and I've already made two dozen. I'll have to add some to the remaining batter and see if it changes the way the cookies taste. This isn't the first time I've messed up a recipe! It's been a pretty lazy Saturday so far. 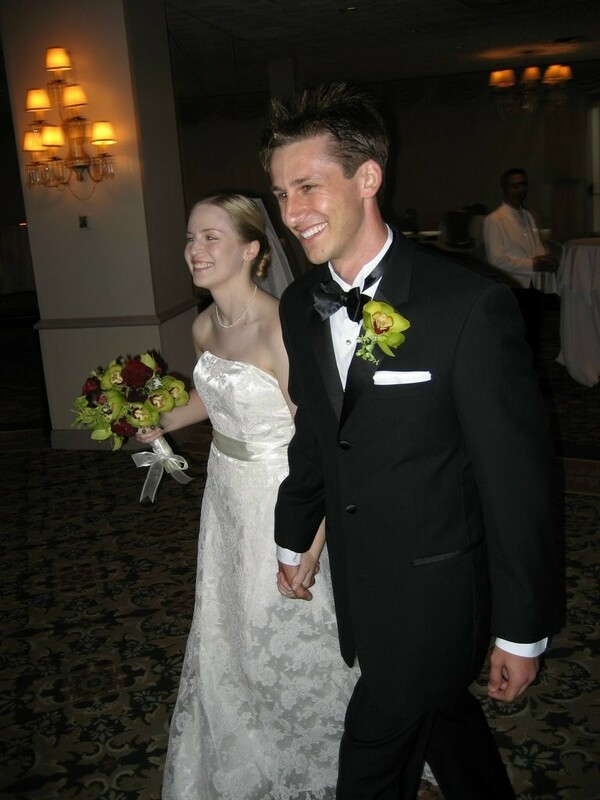 I've made some updates to our wedding webpage, though. Last week we found out that our rehearsal is scheduled for 6 PM the day before the wedding so I added that information to the webpage. Also, I finally got around to creating and uploading the bridesmaids and groomsmen pages. Now I need to get around to the rest of things on my to do list for the weekend. I can't believe it's already June. Three weeks from today is our wedding day. Time flies! My wedding dress is now hanging in a closet at my house. Picking it up and taking it home was a real pain at lunchtime when it seemed like everyone in Southern California was driving on Hawthorne Blvd, but at least I got the dress home safe and sound. Now I just need to find a garment bag for it. Other than getting my dress, my day has been uneventful. It's almost time for me to leave work and go to the gym. Then I'm meeting Dan at Arthur Murray at 7:45 PM. Since Dan and I are driving down to San Diego on Tuesday to meet with our florist and photographer, I'll probably work one day this weekend to make up the hours. It's not an ideal way to spend the weekend, but with our honeymoon coming up I can't afford to take any time off! Plus, I have a ton of work to do. I'll do my best to enjoy whatever free time I can squeeze out of this weekend, though!